Raw this week was a big improvement on the week before, with the match ups being well thought out and then on the most part well executed in the ring. With Money in the Bank just six days away there were a number of talking points coming out of the show, but did the show do it’s job as WWE’s last major attempt to garner pay-per-view buys this Sunday? Let’s find out! This match was made at the top of the show by then Managing Supervisor of Raw Vickie Guerrero (more on her later). It’s a match we’ve seen on a number of occasions before including at Wrestlemania XXVII two years ago, but this is a contest that always seems to deliver, so I was excited at the prospect of this main eventing Monday night. To build for the contest we had a pair of interviews backstage from Josh Matthews, firstly with Randy Orton. We got a regular cool calculated promo from Orton who talked about how he didn’t consider CM Punk to be the Best in the World, before interestingly Orton turned his interest to John Cena, saying if Cena retains his WWE Championship at Money in the Bank, he would love to cash in a Money in the Bank briefcase against him. This would seem to be another sign of Orton heel turn, which seems to be back in the works again recently. Later, Matthews found Punk and asked him for his reponse to Orton’s comments, Punk cut a good promo about what make him the Best in the World, before going on to say he would capture the briefcase on Sunday. The crowd was split between Orton and Punk for most of the contest, even with Orton working more of a heel role, controlling the match and methodically stomping on Punk. Each time Punk would work his way up to a come back, Orton would quickly quash the attack from Punk with each man working a number nice quick reversals that made the match feel more important than it actually was, such a Punk halting an Orton uppercut to get a crucifix roll up for a near fall. Orton looks a lot more comfortable in the ring when given a clearly defined roll within these face vs. face matches, as we saw on Smackdown against Christian when Orton had no particular role the match failed to get going. The ending saw Punk going for a GTS, with Orton escaping going for an RKO Punk blocked with a thunderous kick to the skull, which allowed him to hit the GTS for the victory. It was a good ending that didn’t harm Orton as he fought til the end, whilst keeping Punk’s momentum going heading into his proposed Summerslam match with Brock Lesnar. For the amount of time it was give, about ten minutes worth of television time, this was a good match that was worked well, but that should really be expected from two of WWE’s premier talents. On evidence from this match, Orton will benefit from a heel run in WWE, as he always looks much more comfortable in control and playing that calculating character we knew back in 2009, than the smiling baby face in peril we saw from him over the last two years. After the match, Daniel Bryan ran out to the ring, taking out CM Punk by throwing him into the ringpost. Before getting a Ladder from under the ring to take down Orton. To close the show Bryan scaled the Ladder and took down the briefcase. I was happy that WWE opted against a mass brawl featuring all the Money in the Bank competitors to close the show, as we’ve seen that so many times and it really doesn’t do much to make me want to watch the pay-per-view. Building this story with Bryan into the match, doing anything he can to get the briefcase certainly seems like the right decision as it gives the competitors in the match something extra to play with, rather than the regular spot after spot feel of these types of matches. Now anyone that is a regular reader of these reviews will know that I have two types of segments that I can’t stand being used in wrestling. The first one of these being the contract signing, the second being the “Face to Face” confrontation. This is a fairly new phenomenon in WWE, but has been completely over the last two years. It usually turns up when WWE is unable to think of any other ways to keep a story going and therefore sticks both guys in the ring to talk about their upcoming pay-per-view contest. 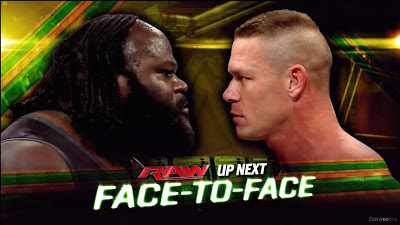 It works when both guys have been staying out of each others way, like John Cena and The Rock building up to their first Wrestlemania match, but we’ve seen Cena and Henry in the ring together a number of times over the last few weeks, so how would this “Face to Face” be any different? To add to the confusion, after Vickie Guerrero had already announced the segment at the start of show, Michael Cole began to talk up a tweet sent out by Henry earlier in the night, challenging Cena to meet him in the ring, now I have no problem with this being used as a plot device, but why have Vickie announced it and then talk like she didn’t? Surely the suspense and intrigue would have been higher for the segment, if it was left open as to whether Cena would turn to confront Henry after clearly showing he was scared of the World’s Strongest Man last week. Oddly Cena was the first one out, actually calling Henry out instead. In terms of what had been mentioned earlier it didn’t really make sense, and any good that had been done with Cena showing weakness in front of Henry was thrown away in about two minutes. Once Henry came down to the ring, for me anyway, he outshone Cena at pretty much every turn. With Cena insistent on making jokes about chocolate, it hurt the segment repeatedly, it makes it look like Henry isn’t a threat to Cena when he makes jokes in his face and forgets that Henry fooled Cena only three weeks ago. Henry’s talking was done cool and collected, whilst Cena’s was full over exaggerated “intensity” that we’ve come to expect from Cena. Someone should teach Cena one of the first rules of acting, you don’t need to shout to show intensity. I think the main thing that came out throughout this for me, was that whilst Henry’s talking seemed to come from a real place and used real emotions of Henry himself, Cena’s came off as simply phony. The segment finished with the WWE Champion unable to hit the Attitude Adjustment on The World’s Strongest Man, who destroyed Cena with a World Strongest Slam before posing with the WWE Championship. It wasn’t a bad finish to the segment, but will only really have worked if it is remember at Money in the Bank. I don’t think I’ve ever seen a rivalry lose momentum as quickly as this one, it felt like we were really in for something special four weeks ago when this started, yet each week as we’ve gone in, it’s become pretty much exactly the same as any recent John Cena rivalry with recycled segment ideas. The show kicked off with Vickie Guerrero talking about her job evaluation later in the show. Vickie climbed a Ladder and did most of her talking from there. Vickie actually did quite a good job with this promo, talking about her career and how she never received any help. For me, with no background in wrestling, other than her husband Eddie, Vickie always blows me away with promo ability. The only problem WWE has had with Vickie over the last few weeks is it seemed clear WWE was attempting to make her face against the McMahon family, however it never really payed off, with the crowd still content to boo her out of the building at every opportunity. We finished this segment with Jerry Lawler announcing that a WWE app vote would influence the decision of the McMahon’s later on. Another poor use of the app by WWE, it was always clear what the vote decision was going to be. The job evaluation started with Vickie Guerrero running through “triumphs” of her latest reign as General Manager, including a number a return and the hilarious notion that The Undertaker returned to WWE because of Vickie. Stephanie was the first McMahon to speak up, talking about when Vickie signed Brock Lesnar to a contract, this was a nice bit of continuity for WWE that helped add to the realism of the segment. Vince was next, apparently championing Vickie for her entertaining ways, with Triple H arguing that Vickie’s entertaining factor was unintentional, saying she was terrible at her job. Triple H talked about how Vickie being booed on every show was bad for business. Eventually Triple H conceded that Vince obviously had the final say, due to being the Chairman, clearly forgetting when Vince got relieved of his duties on Raw two years ago. The two men eventually decided to let Stephanie make the decision on Vickie’s job, with Stephanie throwing it to the App vote. It was clear from here, that Vickie got FIRED! The whole build up was a little convoluted, and was really nothing to do with Vickie Guerrero, it was simply a way to get over the fractured McMahon family. With Vickie throwning a fit in the ring, and doing a very good job at it, even if you couldn’t hear most of what she was saying. Throwing herself around the ring and jumping on the McMahon’s desk, it really helped to show what the job had meant to Vickie. With Triple H and Stephanie leaving the ring, Vince attempted to console Vickie. Insulting the WWE fans for their decision, in what would apparently seal Vince’s return to heel role, something I’d much rather see than a smiling Vince McMahon. Vince went on to appoint Brad Maddox as the new General Manager of Raw! He told the fans they brought this on themselves, whilst Brad looked shocked and generally confused. Personally, I like Brad Maddox and find him amusing when on commentary for NXT, and am interested to see where this will go in the next couple of weeks. After the job evaluation we saw Vince & Vikice backstage, with Vince attempting to console Vickie once more. This is when Brad Maddox turned up to thank Vince for giving him the job. Neither Vince or Vickie where impressed, leading Vickie to attack Maddox beating on him, until ending up in a heap on the floor. I’m not quite sure where this is leading between Vickie and Brad and really not sure if it was needed, we’d already seen Vickie upset with Brad but where do they go from here with Vickie and Brad rivalry? The next time Vickie Guerrero turned up was a lot more interesting, with Vickie collecting her possessions from her office, Ryback turned up to give Vickie a hug and tell her it was going to be okay. Is WWE possible moving Vickie into a position as Ryback’s manager? This position has a lot of potential and would help to cover up Ryback’s lack of mic ability well. Also this week, we got to witness the most anticipated Raw debut in recent memory. I am of course talking about Bray Wyatt, and NXT Tag Team Champions Luke Harper and Eric Rowan, The Wyatt Family. The debut was hype throughout the night, with a WWE reporter attempting to reach The Wyatt Family in there “home”. These segments were very well put together and extremely well filmed, telling a good story and helping us as viewers learn more about the dynamic of The Wyatt Family before we got to see them turn up in Baltimore. The match chosen for their debut saw two All Stars Money in the Bank competitors Christian and Kane face each other one on one. The match between the two was an entertaining contest with bot h working there roles well. Christian looked good fighting underneath using his agility to his advantage, whilst Kane also looked impressive when in control. Kane eventually picked up the win after blocking a Spear from Christian and delivering a chokeslam for the pinfall. It was decent finish, but I can’t help but think that we’ve rarely seen Christian pick up an important victory over the last month, especially against any of the fellow All Stars in the Money in the Bank Ladder Match, and he goes into the contest looking the weakest and least likely to pick up the win. This is where the Wyatt Family turned up, after one final vignette, Bray Wyatt and co headed into the arena, with Bray holding a lamp, which was the only light in the arena. It was really effective and I certainly had a chill down my spine as they headed towards the ring. With Bray sitting in his rocking chair, the NXT Tag Team Champions took on Kane. Using the steel steps, Harper and Rowan took control of Kane, wedging Kane’s head between the steeps in an impressive visual. It was certainly worth the wait for The Wyatt Family, and I can’t wait to see them again. In another match set up by Vickie Guerrero in an attempt to save herself from the WWE App, Sheamus took on Daniel Bryan. It’s good to see Sheamus back in a serious role and matches against the likes of Daniel Bryan will certainly help him improve as a performer. It was rough and tumble contest with both men bringing a lot into the match and therefore each getting a lot out of it. There were a number of spots throughout the contest, with a personal highlight seeing Bryan attempt his signature flying knee of the apron on for Sheamus to catch him a stumble backwards sending Bryan into the barricade. I’m not sure if Sheamus was meant to fall, but it certainly added to the realism of the match. The ending saw some nice reversals by both men, with Bryan able to use a crucifix takedown to get Sheamus in the No Lock, only for Sheamus to reverse the hold in a Clover Leaf Leg Lock, with Bryan seemingly with no way out of the hold he managed to somehow get Sheamus into a Small Package for the pinfall the victory. For me, the ending was satisfying as it wasn’t a particularly decisive victory for Bryan, so it didn’t particularly harm Sheamus, but was worked like most of the match at a good pace and intensity which made it feel important to the upcoming Money in the Bank match. Diva’s Champion AJ Lee and Dolph Ziggler’s relationship problems seemed to be solved this week, with AJ and Dolph agreeing that they will both be champions by the end of Money in the Bank. I’ve got a feeling the AJ could be about to turn on Dolph in his World Heavyweight Championship match, further cementing Ziggler’s face turn. Dolph’s opponent at Money in the Bank, World Heavyweight Champion Alberto Del Rio was in action this week against Sin Cara. It’s a match we’ve seen a number of times, and it usually is a pretty decent contest. The same could be said here, even if it felt like we were going through the motions as both men waited for Dolph Ziggler to walk out. With Ziggler causing the distraction by pretending to announce Del Rio, a la the suspended Ricardo Rodriguez. Del Rio and Ziggler then went at it outside the ring and it really helped to get over the passion that has gone into the rivalry and build my excitement for their contest at Money in the Bank. Josh Matthew’s had a busy night as he interviewed the contestants taking part in the World Heavyweight Championship Money in the Bank Ladder Match. A number of stories were explored going into the match, including the idea that Cody Rhodes and Damien Sandow will not turn on each (expect them to), Jack Swagger and Antonio Cesaro’s new partnership, and the fact that everyone hates Fandango who received a Bull Hammer Elbow from Wade Barrett. With only Dean Ambrose absent from the segment, I saw this as a good way to present all the different elements that we have going into the match in a quick segment. Intercontinental Champion Curtis Axel was also in action this week, facing off against Chris Jerich, with The Miz on commentary. Similar to the match we saw between the two on Smackdown a few weeks ago this was another enjoyable contest that allowed Axel to look competitive against a legitmate WWE superstar. The ending saw The Miz distracting Axel on the outside, with Heyman having to pull Axel away to prevent a countout loss, only for Axel to walk straight into a Codebreaker from Jericho, to hand Axel his first defeat since Heyman took him under his wing. It didn’t really make me want to watch Axel vs. The Miz anymore, but that’s mainly down to the fact that I just can’t stand The Miz as a face. Personally though I think Axel’s matches with Chris Jericho have done him a whole lot better than his match with either Triple H or John Cena. The Shield also had a warm up match for their Tag Team Championship defense against The Usos at Money in the Bank Kick-Off on Sunday, facing of against Tons of Funk. I was actually incredibly surprised by this match, as I had expected The Shield to pick up a quick victory and leave. However, the match was given a fair amount of time, that helped both The Shield and Tons of Funk. Obviously, the story here was The Shield overcoming the strength and power of Tensai and Brodus Clay, with Reigns and Rollins quickly gaining control of Clay. Now Brodus Clay wouldn’t be my first candidate to play to face in peril role, but he actually did a fairly good job, before making the hot tag after a slightly bizarre backslide on Roman Reigns. The ending was another highlight with Seth Rollins really excelling himself taking down both Tensai and Clay allowing Reigns to hit a spear on Tensai for the victory. This match reminded me as a wrestling fan to wait and see what happens in a match before rubbishing it, because you never know what you might actually get. The Divas where also in action this week, in a tag team match pitting Kaitlyn and Layla against Diva’s Champion AJ Lee and Alicia Fox. It didn’t take long for the match to break down with Kaitlyn attacking AJ, leading Layla and Alicia to attempt to separate them. Kaitlyn hit a crazy spear on the outside to AJ before continuing to beat on her, before getting pulled away by Layla. In terms of build for a Diva’s Championship match this is the best I can think of in the last couple of years, we’ll forget about the horrible photoshop a few weeks ago, because apart from that it’s been spot on. What wasn’t spot on was The Bella Twins who were on commentary putting down the rivalry in an attempt to put over their reality TV show, Total Divas. It just makes no sense to have them rubbish your top two Divas, to promote another show, surely everything should be working together instead of against. What have I learnt from this weeks edition of Raw? 1. WWE has a major push in store for Daniel Bryan, whether he wins the Money in the Bank contract or not. 2. Mark Henry is a better promo guy than John Cena. 3. App votes are pretty pointless.